Do you need improved visibility & control of your WAN traffic to maximise user experience & network performance? Watch our short video blog on the key features of Exinda’s WAN Orchestration. The webinar referenced in this video will be available on this blog shortly. Hosted at Mercedes Benz World, Juniper Networks’ and Netutils’ recent workshop on Innovative Transitions in Networking & Security provided an opportunity for our customers to learn about Juniper Network’s latest innovations in networking & security. Watch the video from the day here. Views expressed in this post are original thoughts posted by Malcolm Orekoya, Technical Specialist, Netutils. These views are his own and in no way do they represent the views of the company. How do we enhance security but allow users access to the data and resources they need seamlessly and improve enterprise productivity, while still keeping up with the trends in mobility, consumerisation and cloud? The answer is by following those trends. Look beyond the technology and look at the people that use the technology. This tells us two things: users do not prioritise security, and your enterprise productivity is directly related to the ability of your users to perform their tasks efficiently. So companies cannot adopt a “lock everything down” mentality. It is effectively a denial of service attack against yourself, because you are essentially denying access to the essential services needed by your users. So security, and enforcement of it, is solely the responsibility of the enterprise. It may sound harsh, but it is the reality; employees are accountable for the procedures, guidelines and policies to which they are required to adhere to. The only viable way to build a secure network that moves with CoIT is to use existing corporate user identity systems (such as Active Directory, LDAP, SQL) to integrate with evolving ideas to automatically provision context-aware applications and resources. So how to secure data and the network while still allowing seamless access and speedy resource allocation? Don’t ignore the trends in the IT industry. Cloud and hosted applications are continually increasing in adoption because they guarantee a certain level of security of access, ease of access, flexibility, automated provisioning, ease of upgrades, cross platform compatibility and reduced CAPEX, while maintaining compliance and security standards. The providers of these solutions are themselves heavily regulated and required to adhere to high standards of data and network security. If you prefer to retain in-house control of applications, then virtual desktop infrastructure (VDI) means you benefit from reduced costs over time of purchasing user endpoint machines by moving to thin clients. But also these VDI platforms allow control of what applications employees have access to, and provide much more granular control on what tasks users can perform. Because a lot of the VDI platforms allow “hot-desking”, as user profiles are maintained on centralised servers, they provide access flexibility and remote access, which fit with CoIT needs. Zero-Day protection is also another useful trend; the means by which an enterprise can protect its data and resources from threats and vulnerabilities that are currently unknown, so consequently do not have a fix. Zero-Day application exploits, targeted attacks, advanced information stealing malware and Advanced Persistent Threats (APTs) all pose a serious security threat to enterprises, but as these threats evolve, so does the approach to effective and manageable protection. Active defence, which discourages attacks by focusing on raising costs and risks to attackers, is slowly creeping into enterprise strategy. Proactive protection – including advanced Web Application Firewalls (WAF), counterstrike and intrusion deception techniques – are all protection methods that have seen a revival. For example, in 2012 Juniper Networks acquired Mykonos Software’s intrusion deception software (Junos WebApp Secure) to enhance its web application security portfolio. It places deception points along the way. When an attacker trips one of those tripwires, we are alerted to the fact they are there and can watch them. The reality is that vulnerabilities and threats exist, and come from inside as well as outside the network. The biggest insider threats are the employees, but we can only educate staff on how to handle sensitive corporate data and how to use corporate resources. For outsider threats, innovation brings assistance. The rise of user expectations for anytime, anywhere wireless access places increasing pressures on the IT team. To meet this demand today’s organisations are required to offer guest Wi-Fi services throughout the communal areas of their head and branch offices for visitors, contractors and staff. View our webinar recording here on our Cloudutils Guest Access solution. If your role includes responsibility for cloud application performance and delivery and you identify with one or more of these issues then watch our webinar here. 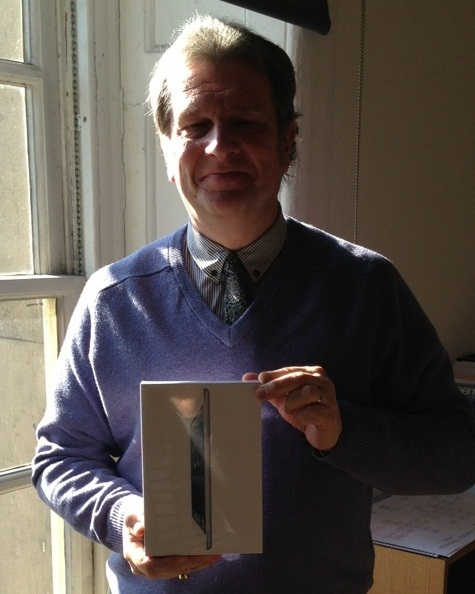 Meet Janusz Naks, Information Security Manager and winner of our iPad mini prize draw at Cloud Expo Europe. Janusz was a visitor to our stand at the event in January 2013 where we launched Cloudutils, our range of cloud services.